Heat oven to 350°F. Bake biscuits as directed on bag. Cool slightly, about 5 minutes. In 10-inch nonstick skillet, heat chicken, buffalo sauce and celery over medium heat about 3 minutes, stirring frequently, until hot. Stir in blue cheese. Split biscuits horizontally. 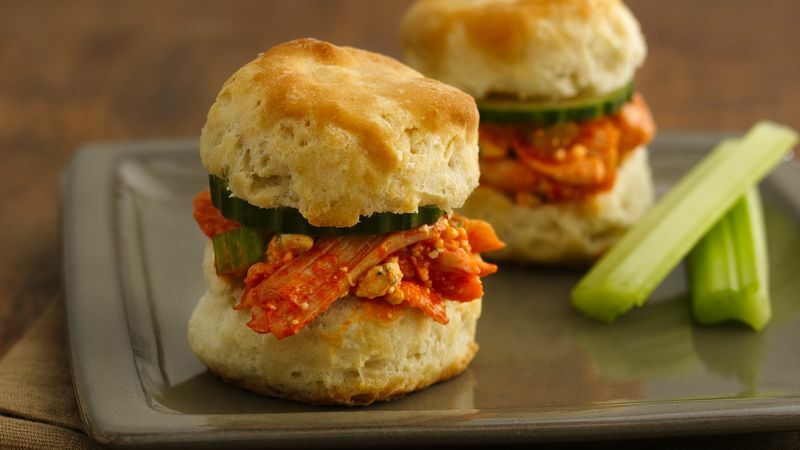 Spoon chicken mixture onto bottom halves of biscuits; top with cucumber slices and biscuit tops. Purchased rotisserie chicken is a easy way to get shredded chicken. Blue cheese dressing makes a nice accompaniment to these sliders.